Set after the events of 2009s franchise rebooting prequel-come-sequel (it's a long story...), Into Darkness opens on a distant planet as we find the intrepid crew of the U.S.S Enterprise mid-mission - thrusting the audience straight into the middle of the action in a way that felt reminiscent of the opening sequence on Hoth in The Empire Strikes Back. Of course, as you can probably imagine, it doesn't take long before things very quickly go out of control, forcing the infamous Captain Kirk (Chris Pine), and his expert team boasting the unforgettable Spock (Zachary Quinto), Uhura (Zoe Salanda), Bones McCoy (Karl Urban, the chin of Dredd himself), and Scotty (Simon Pegg) to make some rash decisions to get out alive - not without consequences of course. 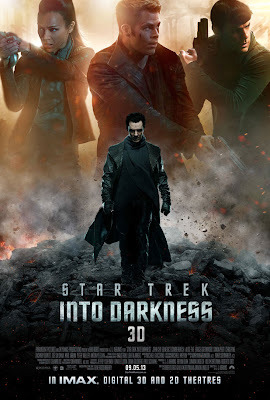 As the team head back home to the Starfleet headquarters, news comes in that the London branch has been the victim of a large terrorist attack, helmed by the mysterious John Harrison (Benedict Cumberbatch) who has a large vendetta against the intergalactic Peace Corps that he seeks to settle. 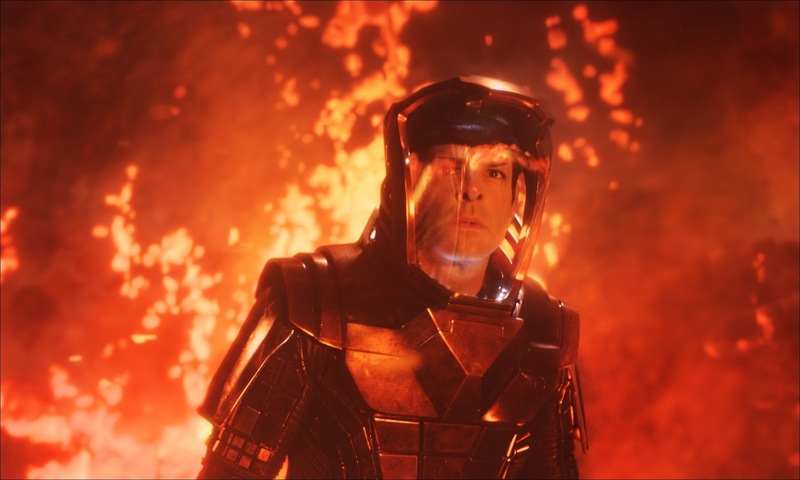 Zachary Quinto's Spock amidst a volcanic visual spectacle. Instantly, the first thing to be said about Into Darkness as the film opens to shots of an alien world - filled with a forest of red trees, ancient temples and an erupting volcano - is that the impressive visual aesthetic of the franchise has been retained from its predecessor. Once again, the slick stylistic flair (and trademark Abrams lens-flare) of the Star Trek universe is brought to life beautifully, bringing an engaging depth and majestic wonder to the worlds that are explored, including a futuristic version of Earth. The CGI effects are truly second to none, but of course that is all secondary to the plot; give me a film with rubbish visual effects any day as long as it has a captivating storyline, over one without. Fortunately, Into Darkness features the best of both. 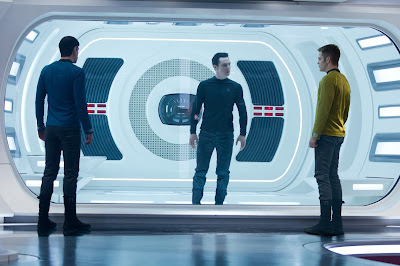 Based on the television series created in the 60s, Star Trek Into Darkness stays true enough to its source material's characters and ethos whilst infusing a modern spin through its updated visuals, which in doing so creates a loving old fashioned science-fiction story for a new generation. Perhaps more impressive is that fact that it does so without feeling at all outdated, as fantasies of space-exploration are still alive and strong today as they were during the decade that first put man on the moon. More than that, the film simply nurtures the human lust for adventure, and nothing quite delivers that like Into Darkness' enthralling action sequences. Fast paced and on a large scale, the film features a number of scenes that are as exciting and satisfying as they are ambitious. However it is the character-driven storyline that really allows the audience to engage in an alien universe, through its richly-written human characters that bring a genuine emotional heart to the film as well. Cumberbatch's villain role takes centre stage amongst Into Darkness' returning cast. Pitting the crew of the U.S.S Enterprise up against their toughest adversary yet, Into Darkness tests relationships between the characters to the limits. The love-to-hate friendship between Spock and Kirk gets a natural evolution which continues on from the first film, as the two become closer to a fully understanding one another. And if times weren't tough enough for poor ol' Mr. Spock, he also has to deal with love interest Uhura who, quite understandably, isn't too happy about some of his selfless actions in the film's opening. The rest of the cast's diverse ensemble also gets their moment in the spotlight, but it is Benedict Cumberbatch who naturally steals the show with his villainous portrayal of a vengeful adversary who alone poses an intimidating physical and intellectual threat. Cumberbatch effortlessly creates a screen presence that creates a constantly shifting power struggle amongst characters, as he gives the sinister smirk of a man two steps ahead. Balancing a wide range of impressive action sequences with an engaging character-driven storyline, Abrams' direction - from production through post-production - pieces together a well-paced, fast-flowing film that, despite a few scenes of exposition-heavy dialogue that slow the pace for just a fraction too long, is difficult not to enjoy. Star Trek Into Darkness (certificate 12A) is now showing in cinemas across the UK. 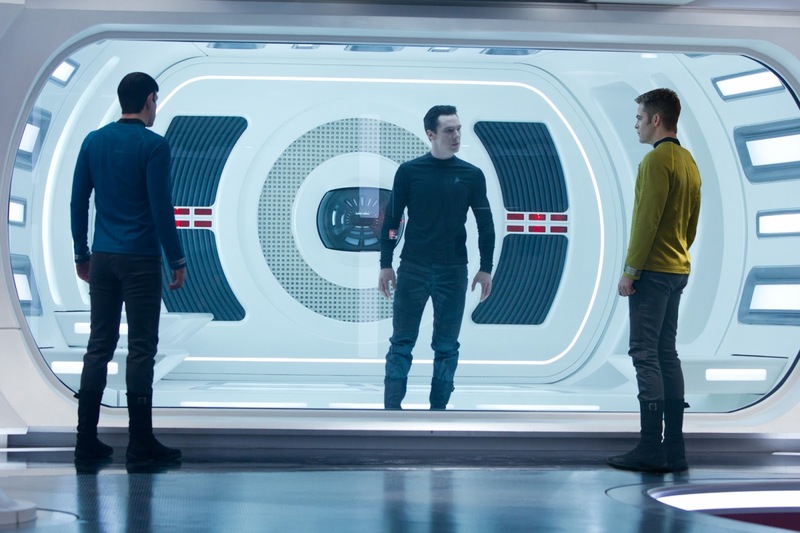 Have you seen Star Trek Into Darkness? Leave your thoughts and opinions in the comments section below! I went to watch the film earlier and very much enjoyed it! I agree with your review -- "heavy exposition dialogue" at times but on the whole it was stunning. Cumberbatch was great, and JJ Abrams is definitely the man for Star Wars. LLAP! I'm afraid I'm going to have to disagree with you Dave and say this film has actually turned me off the rebooted star trek. I don't claim to be a Trekkie, but I do dabble from time to time having watched most films and the odd episode of the original, TNG and voyager tv series. Along with plot holes; I was most disappointed with the engine room of the enterprise and the characters Chekov and Harrison. I believe it was best put to me that the reboot enterprise has a bridge from one of Steve Job's wet dreams but an engine room from the titanic. Although the latter is an extreme example, I do believe they are too mismatched to be on the same ship. Although on the subject, at least the film was more willing to show the ship (arguably a character of its own) compared to the first reboot. Both reboot films has left me disappointed with Chekov. In both he seems to exist purely to plug any gaps in the crew with the newfound ability to do anything on the ship when needed. And finally we have Harrison. Without wanting to give any spoilers, based on the background I believe he was miscast. A little more specifically, Harrison should not have been English! Cumberbatch performed fantastically, but a good performance only saves poor writing so far. Being a fan of the original Star Trek 2, this film paled in comparison by attempting to provide what I felt was unnecessary fan service, a problem that occurred throughout the film.